Funny how this run of Choose My Adventure arrives after we’ve had a discussion about designed downtime, because the crafting and gathering in Legends of Aria is the kind of designed downtime that I’m alright with — a very zen, chill, and laid-back affair. At least in the interim. 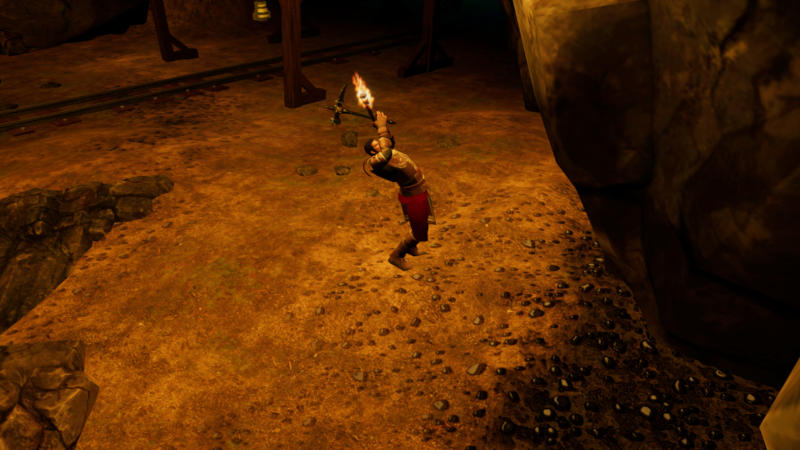 Where starting out as a new combat class in Legends of Aria right now (still a developing game, after all) feels like being kicked in the soft bits and told to do jumpingjacks immediately afterward, being a Blacksmith as chosen by the readers is way less stressful. You’re still kind of punted in to the deep end and made to swim, but at least it seems manageable. Though I’ll admit that could be attributed to my arriving on the scene with a bit more knowledge. My alt Bwee — a name that just happened as a result of mental word vomit — arrived to the town of Helm, a chosen starting point due to its apparent importance to miners and blacksmiths. Seemed an obvious choice, really, and it was definitely the right one; there was a mine just to the west of town. It’s almost like this was purpose-built for new arrivals to onboard them easier or something. Mining in this game is pretty simple: You simply make sure you’ve got a pick equipped, toddle on over to any large sized rock, hit Q to create a reticle, and target your chosen source of stones, which sets your avatar into a stiff and weird mining animation. Then you just sort of sit there and wait until the rock gives up all of its resources and changes shape into something that looks like someone took a bite out of a log of raw cookie dough. This sounds astonishingly boring, yes, but it also kind of just let me turn off my brain for a while and relax. It’s the sort of idle adventure you take up while looking at other stuff like cute puppy pictures or a Discord chat with friends. More often than not, I turned on some relaxing music, sat back, and ate rocks after my shift at work. The best part about the mining is that this seems to be a long, mindless grind. When I say “long” and “mindless,” I mean those terms in the most endearing way possible. I don’t know what it is about me and chore-based classes or tasks in sandbox MMOs, but I almost always feel compelled to trade swords for plowshares. Blacksmithing is equally as pleasantly mindless in that you simply select your recipe and hit “Craft All” to… uh… craft all the things. Not the world’s greatest crafting system, and another reminder that it’d be super freaking keen if an MMORPG actually made crafting a skill-based endeavor instead of one that can be steered by stats and RNG, but it worked. I tested the waters by smashing out a few ingots of iron after hauling in better than 100 chunks of ore and wondered why doing so didn’t increase my skill. It was then that I noticed the “trivial” tag in the recipe menu. Fair enough, video game; I’ll try something a bit harder. 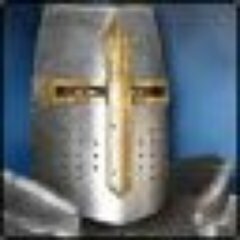 I knocked out a couple of longswords and a mace to replace the starter mace I was granted, and sure enough, there were the skill advancement alerts. I headed over to a shop NPC near the anvil I was using to sell my freshly baked vendor trash and noticed a conversation option about crafting orders. These are like the missions you can get as a combat character, only with goals that are actually attainable. For once, I was feeling motivated and enjoying things in Aria again. Right until the server had to do a scheduled restart and I had to reinstall a few hashes because of course I did. After yet another update, I set back to my task with gusto, eating rocks and knocking out the crafting order for 10 iron longswords. What’s different here is that you have to actually bundle your created items to the order itself, which means right-clicking on the order item in your inventory and clicking the items with the targeting reticle that appears. Again, not an earth-shattering development, but just another layer of designed downtime busywork that I find relaxing. 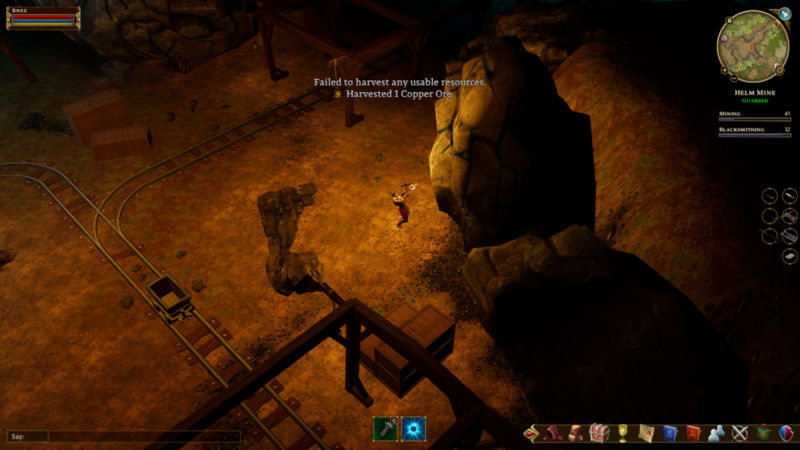 This happened for a number of hours as I darted back and forth between the mines, the anvil, and the NPC, picking up and turning in crafting orders. 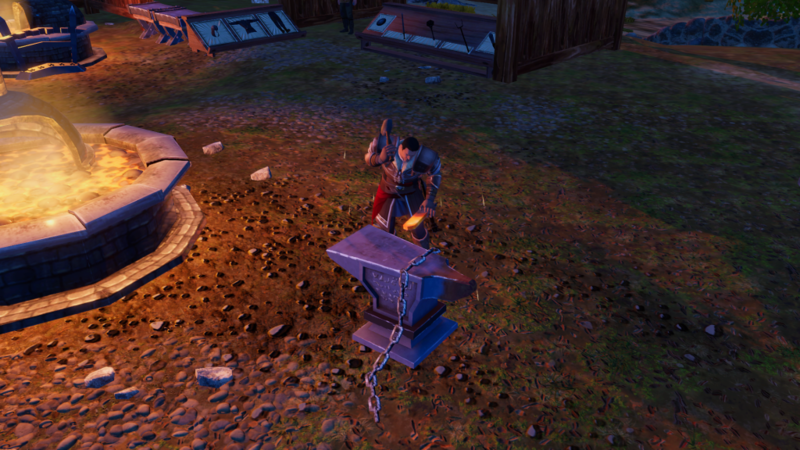 After collecting a few item recipes as rewards, I decided to try to test the waters of my burgeoning Blacksmithing career. It’s at this point that the honeymoon veneer began to dull just a tiny bit. First off, the mining. As I said before, you go to a rock and awkwardly bang on it with a pick. The thing is, there’s no immediately obvious way to know what rock will yield what. I thought I had figured out at one point as I paid closer attention to the texture on the stone. My thought process operated like this: Okay, so the striations on this rock are less than this one, and I think this one has a different color? So I think that this one will yield the iron ore I nee- nope, it’s copper. This is copper. I’m pretty sure that there are more obvious visual cues, but the mines are dark and my eyes are the hottest, spiciest of garbage, so I’ll admit to ignorance here. Still, it’d be nice to be sure. My second pain point is the way crafting works in relation to your skill level. I had assumed — perhaps foolishly — that being at skill level 30 meant I could craft skill level 30 items, so I was confused by the fact that I was failing over and over again when trying to bang out a certain item. After some research, though, it turns out that your skill level isn’t a hard point of mastery; it’s a threshold. The advice that I found suggested to craft items between 5 and 15 points below your current skill level. Which would have been nice to know. In the game. Another issue I saw rising up was the fact that my Mining skill was leveling up far faster than my Blacksmithing skill. I’ll admit that this probably is more a fault of not knowing about that threshold thing, but it would be nice if successful crafting of items pushed that bar just a bit further. Clearly, I’m done with my time in Legends of Aria, but it has given me a lot of food for thought; about sandbox MMORPGs, about where I fall in the spectrum between themepark and sandbox, and about the kinds of things I should look for. But that’s a subject for next week. In the meantime, it’s time to open the polls for our next adventure. Sea of Thieves: My husband has been very invested in this one, sailing the game’s digital seas almost nightly. Considering this is a game that I would likely hate arriving to solo, it’d be good to arrive as a duo here. RuneScape: A nostalgia trip for him and a new experience for me, this classic sandbox seems like the perfect game to arrive together with. Neverwinter: It’ll be on-the-rails, I’ll admit, but it also should be fun with the two of us playing through things together. Also, we are very hard in to D&D even though this game’s resemblance to the TTRPG is….negligible at best. 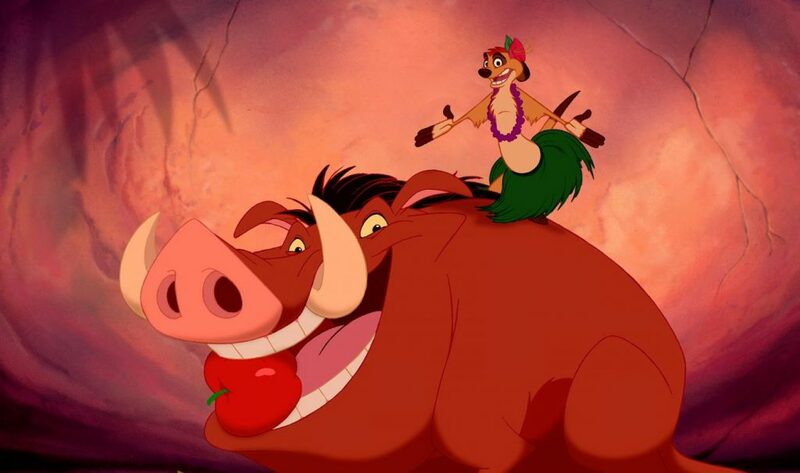 What game should the two of us play next? Choose Our Adventure! Once more, polls will close at 1:00 p.m. EDT on Friday, March 29th. In the meantime, I’ve got to clean out the sand from my boots. It’s coarse and rough and irritating, and it gets everywhere. 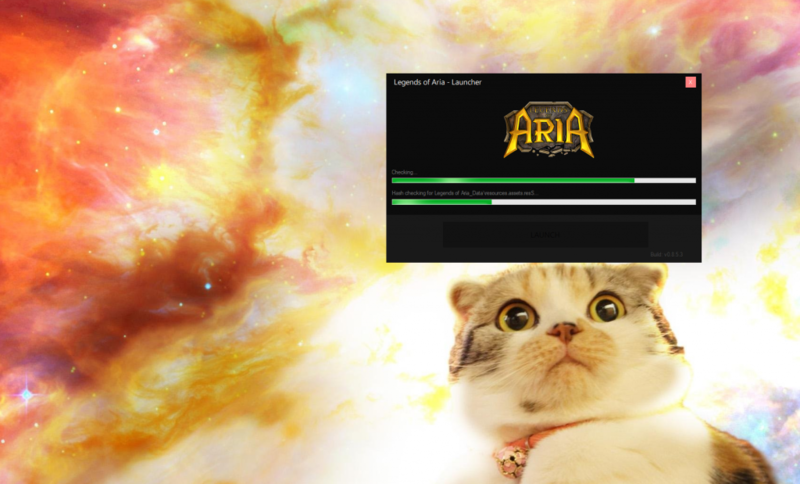 I really love Aria, though I play on the Ultima server. Great community and fun MMO. Your Inspiration for Bwee is Bree in Wabbit language? And well your experience sounded so and so, mainly due to the general roughness of sandboxes, especially indie ones. I would sometime like you try EVE though which is more polished and easier to get into but still hard to master.